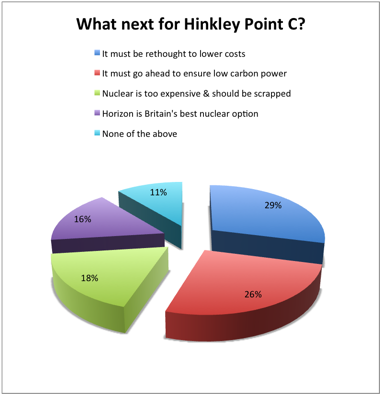 Last week’s Poll: what next for Hinkley Point C? The story of Hinkley Point C looks to be developing into one of the most complex in Britain’s long history of nuclear power, and is still very much unresolved a week after we put this question to our readership – not for the first time, and we very much doubt whether it will be the last. Of the 624 readers who responded to the poll, the largest group, 29 per cent, thought the Hinkley Point C project should be rethought to lower costs, while 26 per cent thought it should go ahead to ensure supplies of low-carbon power. There was then a large gap to the next group, the nuclear opponents, who picked the option saying nuclear was too expensive and should be scrapped; while the option to support the alternative nuclear technology proposed by Horizon nuclear power gathered 16 per cent of the support. A further 11 per cent declined to pick an option. The lively comments section touched on options for small modular nuclear based on submarine reactor technology; the pros and cons of reactivating coal-fired plants with and without CCS; development of tidal lagoon power and the effects of privatisation. We would, of course, still like to hear your opinions on this subject. This is a rather tendentious poll with one “pro” voting option and four “against” voting options – this will tend to split the “against” vote and enable them to show that “it must go ahead” was the most popular option. There is no speculation that the project is in jeopardy, the speculation is whether political or commercial drivers will triumph. There may be a place for nuclear replacement in the UK – keeping the installed capacity at around the same as current levels to avoid constraining off renewables any more than currently. However, the UK starting on a fourth EPR before any of the first three are operational would be “courageous” minister. (Ref Sir Humphrey). It will be similarly “courageous” for EdF to sign up to build a high risk project they haven’t got the capital finance and will take decades to payback, no matter how rich the profits in years 20-35. TP did the only responsible thing in the circumstances. They don’t need to be operational. One of them should be substantially complete with no roadblocks to completion. Since Taishan III is undergoing instrumentation testing, one would presume it’s there or close enough, though an engineering audit would be need (and I would assume has been done). I have nothing against nuclear power but it seems to me Hinkley C has become stupidly expensive. It epitomizes the opposite of ‘economy of scale’. Do we want to put so many of our energy eggs into one such expensive and long-lead basket? Nuclear power may well be essential as part of the strategy of power generation for the UK but expecting it to be funded commercially by foreign companies or ,maybe worse, foreign powers has got to be short sighted. Stop building new designs!! Just copy Sizewell B design with updated I&C. Repeat x10. Basic engineering all done, simple . I believe China’s Hualong design is pretty much as you say. I think they’ve added some features to allow passive safety. Yes indeed – I just wish they would do that with our Mobile machinery too – Past year or so I have been scunnered with having to repair little Green specialist machines ” Made for Mars” – built by “City Boys”. ‘..because they can do it, it will be built …’ regardless of the necessity and grief it may cause . Sitting on the Education Wall, nowadays, I see more and more vehicles coming in with stupid problems – created by modern technologies. So a lot to be said for older but MATURE technologies – sometimes the “Vorsprung durch Technologie” can lead to broken springs! The UK needs stand-by power urgently and it needs to reduce power prices urgently, also to give UK industry a fighting chance of having any future. The simplest answer, needing a big climb-down form her high horse by Amber Rudd, is to refurbish and re-use our excellent, even if old, coal fired power stations. Germany have even built new coal fired power stations as they had vastly overshot on unreliables and decided to close their nuclear stations. Coal is the lowest cost fuel although oil could also be used. The next part of the long term answer could be to buy nuclear power stations from Russia, who are selling them all over the developing world, They are apparently about $ 5,000 / MWe, far less than EdF’s unproven and dubious design. Unfortunately, the cold war would get in the way and the USA would stop us very quickly! There was a very good suggestion in your pages quite recently – we are capable of making nuclear power plants for our nuclear submarines. We should build a new power station using multiple units of these power units. These units are proven and reliable., and retain our nuclear ability within the UK. A problem with one generator, would not knock out the whole site. One fault with Hinkley would take out 7% of our generating capacity. The long term cost to the consumer of Hinkley is outrageous. I can remember when nuclear power was first proclaimed as our saviour, they said it would be so cheap it would not be worth billing the customers!! What hope! Coal is not an option without working CCS, so that’s out of the window. All the while the Government is steadfastly anti-renewables (for whatever spurious reasons) and pro-nuclear, then the replacement plants need to be proven and cost effective. The current proposals for Hinkley C are neither. I wonder how much this would cost if the need for profits were removed? The obvious way forward are renewables, with an appropriate level of storage (heat, cool, gas, fuels, electricity,…) and backup capacity. Renewables are fuel $avers. As there are three other failures of this type of reactor being built at this moment why continue the stupidity and build a fourth, the others are way over budget way over on predicted completion the answer has to be tidal power generation. The economic supply of electrons is vital to the quality of life and to national prosperity. So what is the best way to pump those electrons? It is by having a very powerful magnetic field and an abundance is high conductivity copper in relative motion. What supplies the relative motion? It is always high temperature, high pressure steam. An optimum way to generate this motive force is through nuclear energy. Pulverised anthracite and flu scrubbers is the alternative. Each boiler producing steam for 500-600 MW and x4 boilers per 2GW station. 40 year life time equipment. It’s established technology and applied contemporary metallurgy. Sourcing the high calorific value anthracite with its attractive very low ash & volatiles content could be a challenge to S Wales deep mining. Fuel cells powered by waste could provide local electricity as well as heat with very high efficiency. Fuel cells also operate alongside solar and wind energy, powered by hydrogen obtained when demand is low. They are operating alongside existing coal fired stations, creating more electricity from the flue gas. The electrochemical process separates the carbon dioxide which can be stored or recycled locally. The IEA states that fuel cells are the only carbon capture and storage technology which has the potential to meet or exceed US DoE cost targets. A recent report by the Grantham Research Institute finds that government support for new energy technologies is unbalanced, with 150 times more funding going to deployment than to R & D. This may encourage innovation in other countries rather than backing British engineers. “Unfortunately, the cold war would get in the way and the USA would stop us very quickly!” Thats funny I thought we won that one? Fellow bloggers may recall from previous posts that I spent some time in the former USSR in 1970. A UK trained Engineer and experienced textile technologist working and living in the USA, but seconded by my US employer to a large textile mill in Kursk which had US made equipment. As Jack infers, originally the US State Department had indeed banned such exports: but later found good reasons for allowing such. Variations in the regularity of that countries power supply-like any other- can and did play havoc with the uniformity of yarn and other textile products wherever it happens. More details of all my ‘doings’ in that nation and this whole aspect of technology available to anyone interested by direct communication to: mikeblamey@yahoo.co.uk. Mike, have I missed something? I thought that the USA was enforcing trade embargoes on Russia and accusing it of being the cause of every problem in the world: especially Ukraine and Syria (in which it was totally an innocent bystander of course). Also, I thought that the only war in the world that had been won since WWII was the Falklands. Funnily enough, we used to have a State owned system, the CEGB, and as power supply was considered so important, the State deemed it necessary to control such itself. Then the grocer’s daughter and her fellow spivs took control. “go back to your constituencies and prepare for Government” I await the call? Here we go again with the UK’s Energy departments and engineering companies dithering around with new multiple designs. As Mervyn Edwards said above: we are capable of making nuclear power plants for our nuclear submarines. We should build a new power station using multiple units of these power units. These units are proven and reliable., and retain our nuclear ability within the UK. A problem with one generator, would not knock out the whole site. So look at building a network of standalone systems as a fully distributive electrical grid throughout the UK. By building in redundancy from using multiple units which have more than 40 years’ reliability (apparently the latest Astute class sub can go more than 20 years before refueling) so let’s push this aspect for protecting the energy requirements and grids stability in bad weather conditions. Mervyn Edwards post 8 th. March. Exactly my thoughts. I suggested this to the Dept for Energy many months ago but was told that it was too difficult. We should be building Bristol Channel tidal lagoons on a modular basis in conjunction with Rolls Royce modular nuclear power plants. If our very generous government would stop giving our tax pounds away to countries that don’t need them we would be able to finance the project ourselves. We need much more good money to throw after bad money into the bottomless pit of nuclear power generation and disposal. The only option here is to improve efficiency and reduce power consumption anywhere, and buy less and less electricity. In the past I used 100W lamps, now I use 20W lamps to get the same light. In the past I used 2000W oil radiators and fan heaters to heat the home. Now I use a 50W electric blanket to heat the bed. In the past I used 2000W water kettle to make tea. My coffee maker uses 300W and doesn’t care whether there is coffee or tea in the pot. What an excellent comment. This is something that the much maligned (and let’s be honest sometimes with justification) EU has been working on. Look at vacuum cleaners; reduction in maximum power and a massive who-ha ensues, despite the wide knowledge that manufacturers were simply putting in oversized and loud motors to hoodwink the consumer. If we got every household to replace their inefficient appliances with efficient ones, by the natural replacement cycle, just imagine the savings for all concerned. Hinckley is a complete waste of money, but nuclear must be part of the mix. We urgently need to develop small modular units based on RR’s sub design. Short term, lots of 200MW units readily deployed on the sites of old coal stations with all the necessary grid infrastructure. Longer term, focus research on Thorium reactors building on the US 70’s experience, aiming to have them deployed by 2030. And all built by British companies. EwanM: Bang on – holding pattern with short/medium term solution to bridge the upcoming crisis; then thorium. It is inexcusable in this day-and-age that engineers continue to peddle uranium as the long-term future. I must disagree with Paul Arrondelle about coal not being an option without CCS: CCS is not an essential, and none of the multitude of coal fired boilers being built in Germany, Japan, India, China…. incorporate this, as yet, developing technology. The old fleet of coal fired power stations could save the UK from energy starvation at very low cost. As Mike Blamey noted there would be great Tory fear of miners re-surfacing! However, coal is available at lower world market prices than any other fuel and Germany is even exporting its coal-based power! Regarding nuclear, the Russian technology looks very good but it’s like mentioning Voldem… to suggest that. As an alternative, we could re-design the AGR power stations as they have been successful for many years and were only replaced by PWRs as the favoured technology due to the pressure from powerful vested interests in the 1980s. These could be built in the UK, apart from boilers/ turbines etc having to be imported now that we have almost stopped making heavy plant. True its developing. However, there are around 15 large scale CCS projects operating around the world – including Boundary Dam on a coal fired station. There are 0 out of 3 EPRs operating. The USA funded a large study (reported in Power) that concluded that advanced power generation technologies without CCS could give more economic carbon reduction than CCS.